The apartment Carpici, is a spacious well appointed 3 bed, 3 bathroom duplex, that can sleep 6 in comfort. The master suite with kingsize bed leads directly out to a large infinity pool. The apartment has real wow factor when you walk through the front door & absorb the views out across Kas, the harbour, the peninsula, the new marina and out to the Greek island of Kastellorizio. (Meis). The apartment faces due west and enjoys wonderful sunsets all year round. Furnished in a modern cosmopolitan style, the emphasis is on quality & comfort. It has a fully equipped kitchen, if you fancy a night off from the wonderful restaurants Kas has to offer. The lounge has 2 sofas and a chaise longue combination where you can take in the view, or watch the 32" LED smart TV with Facebook, U Tube, English speaking news and an on demand movie Chanel. We have our own unlimited Wi Fi, with good reception in all rooms, even on poolside. A Blue ray DVD links automatically to the TV and a blue tooth hifi will enable you to play your music or listen to local internet radio stations including BBC Radio 1,2,4 etc. We have a good selection of Dvd's for all ages, and a cupboard full of board games for the whole family. A book swap shelf is available if you run out of holiday reading. We have set out to provide quality furnishings, beds, and pillows, to help make your stay as comfortable as possible. All our matresses all have a 25 year guarantee. Situated in a small select development 10 minutes walk to the town center, restaurants & bars, the harbor or the nearest beach. The apartment is up above the noise and commotion of the town yet close enough to watch & hear the fishing boats entering & leaving the harbor. Absorb the daily life of Kas below you from your seat on the poolside as the paragliders soar past on thier way to landing on the quay side, or enjoy a pre-dinner drink on your balcony as the sun sets over the peninsula. You can book a welcome pack so you have some provisions for when you arrive and for breakfast, this can include a bottle of something chilling in the fridge for when you arrive. A Grocery shopping and Home delivery service are available, why spend holiday time in the supermarket. Hire your own chef for the night and enjoy dinner on your balcony. baby sitting service with english speaking female baby sitter can be booked. Its all about location, the views are simply stunning. Its a place you can just sit back, relax in comfort, & watch the world go by from the pool side or balcony. The apartment is situated on a small select development and is generously proportioned, with good sized bedrooms and bathrooms all finished and furnished to a high standard. All bedrooms have balconies or patios with sea views. The infinity pool and the views from it are very much the icing on the cake. You will find the apartment is a 10 minute walk from the town centre harbour and nearest beach. Close enough to have easy access, but high enough to be above the bustle, & heat of the town & catch the cooling summer breeze. Kas is a place for those who are a little more discerning about enjoying the best Turkey has to to offer. We believe we are situated in arguably the best location in Kas, with stunning views and cooling summer breezes. We have set out to provide an apartment, finished to the highest standard, that has a blend of cosmopolitan style and comfort that we enjoy, both at home and abroad. Particular emphasis has been put on providing comfortable beds and seating. The quality kitchen is fully equipped to eat in, with halogen hob, electric fan oven & gas BBQ on the balcony. We also have a 20ltr water cooler, Unlimited WiFi, 32"LED Smart TV, Blue Ray DVD, a wide selection on DvD's for all ages and Blue Tooth Hifi. WiFi is available in all rooms and on the poolside, Finally a cupboard full of board games and a selection of books to swap with, in case you run out. Hopefully enough keep all generations happy. After a short while, you will feel compelled to chill out and relax by the infinity pool, watching the para gliders soar past,to land on the quay side below. Soak up the sun listening to the fishing boats chug in and out of the harbour below you, or enjoy a pre dinner drink on the balcony as you watch the sunset over the Peninsula. Its all there for you to enjoy. shower, bidet, Spacious bathroom for bedrom 2, Wet room quadrant shower. shower, bidet, Spacious bathroom for bedrom 3. Wet room quadrant shower. Bathroom 1 en-suite to master bedroom. Large shower room, wet room quadrant shower, WC bidet. Bathroom 2 Large shower room, wet room quadrant shower, WC bidet. Bathroom 3 Large shower room, wet room quadrant shower, WC bidet. A strong mobile signal from the Greek island in the bay is available in the apartment. Greek phone rates are on the inter European tariff and considerably cheaper than Turkish mobile rates. In all bedrooms and living rooms. Quite units for a good nights sleep, with a plasma function for purifying the air. The aircon units double as heat pumps and provide very effective heating if needed out of season. All bedding is provided. If you require additional changes while staying these can be booked through my agent. An intergrated washing machine will be found in the utility area in the downstairs lobby. Unlimited Wi Fi in all rooms. Two x Three seater sofa and a chaise longue combination, with views out to Meis. 32" Smart internet led TV, Unlimited Wi Fi, Blue Ray DVD player + DVD's , Bluetooth stereo, Dining table and leather chairs. Large full height fridge freezer. Sufficient to keep your weekly shop and large quantities of ice cream. Full range of saucepans cooking pots caserole dishes etc. Quality Cups, glasses, crockery and plates to cover 6. Granite worktops with breakfast bar. Latest ceramic hob, fan oven, large fridge freezer, dishwasher, microwave, 4 slice toaster etc, fully equipped. Water Cooler with complimentary 20 ltr bottle. Most dinning is done outside on the balcony, but if you do wish to dine in, the table will expand to seat 6 in comfort. High chairs are available for hire. Blue tooth enabled for streaming direct from phone, iPod or iPad. Can also be used to stream BBC radio from phone via app. Bluray DVD player and good selection of latest DVD's for all ages. A small selection of books are available to swap with, in case you run out of reading material. A good cross section of Dvd's for all ages. Latest DVD releases can be purchased for £1 each in Kas market on a Friday. There are well maintained gardens to the side of the apartment and around the site. On first floor with large living space outside main living area with panoramic views. Small balcony to rear outside 1st floor bedroom with wonderful views over Kas. Guided trips around the bay in Kas are available and day trips to the sunken city of Kekova are also bookable. Please contact our agents for details. Kas is one of the main diving centres in the Eastern Med. Lots of choice, lots of sites for all levels and prices are very reasonable if you wish to log up some hours. 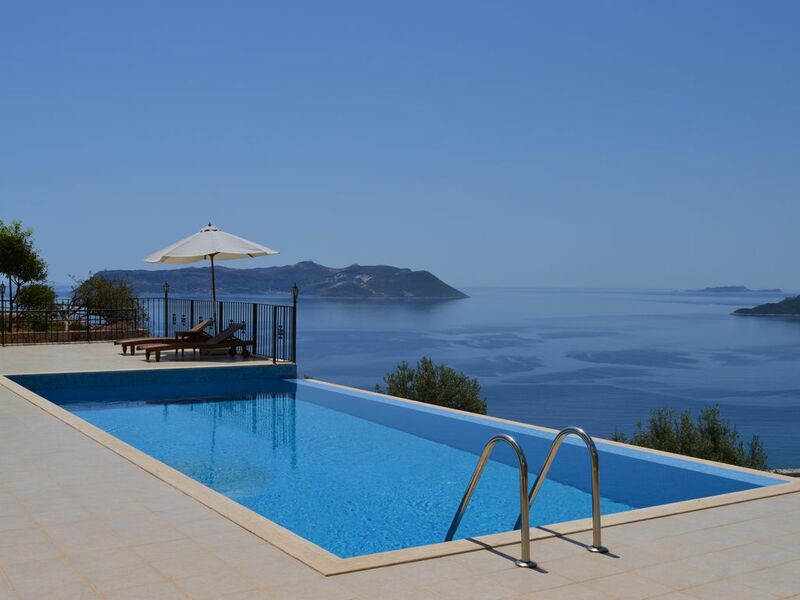 The infinity pool is a generous size compared to most in Kas. There is plenty of space for every one and it is rarely busy, as most people go out for the day. Notes on accommodation: The apartment, is split over two floors with the master bedroom and one twin room on the ground floor and a twin room and living room / kitchen on the first floor. Each room has its own balcony or patio and each twin room has its own large dedicated bathroom, making it ideal for families, or groups of up to 6 adults. The apartment Carpici has recently been furnished to give a modern cosmopolitan feel, with particular attention being paid to providing comfortable beds and seating. This apartment is very much a second home and has been equiped and furnished to the standards and comfort we would expect in our home. To often we have found thin matresses or lumpy pillows have taken the edge off a holiday. Our agent has an office in Kas and is always on hand to help. If you have any requests for airport transfers, car hire, or activities whilst you are in Kas please contact them. Due to the infinity pool and steps, young children need to be properly supervised. Outside: The large infinity pool is shared between the 6 duplex's and 3 penthouses. The pool and patio areas around it, have uninterupted panoramic views and are west facing. Gardens are to the side of the pool areas and have a selection of flowering shrubs and fruit trees. All the apartments are privately owned, and have thier own patios, the poolside is usually quiet. In high season, there is still pleanty of room for everyone, with out being on top of each other. The first floor balcony off the main living area has a dining table and seating for 6. It's a spectacular location for breakfast, lunch, or pre dinner drinks as the sun sets across the Peninsula, before a wander down to one of the many excellent restaurants in town. Sun loungers, Umbrella and mattresses are provided. Utility Room: A separate built in utility area with granite worktop is in the downstairs lobby. Built in washing machine, Iron and Ironing board in cupboard. Cleaning / Towels / Linen / Maid service: End of stay cleaning £45. Linen and towels including pool towels are charged at £9 per person. 14 day and over booking offer. A complimentary mid stay clean and fresh bedding and towels on day 7 A small arrival pack of basic provisions can be purchased. Other: The master bedroom has a king size bed with views over the peninsula & Meis. All bedrooms have plenty of storage. Each bedroom has its own quite air conditioning unit, to enable a comfortable nights sleep, all year round. Winter heating, duvets etc. We absolutely loved our visit to Kas and our stay in this lovely apartment with its magnificent views over the town, mountains and coastline. OK ! The hill up to the apartment is rather steep (especially if you have dodgy knees) but we simply got a taxi for 15 to 20 lire ( circa £2 ). Because of the availability of taxis, local buses and boats we didn’t bother hiring a car. Hilary organised transfers from and to the airport and that couldn’t have worked out better.. door to door and the guy even carried our bags into the apartment. We are going to miss breakfast on the balcony and having an evening beer watching the magnificent sunset. We couldn’t recommend Ian’s apartment highly enough and we will definitely be coming back to the lovely town of Kas with its friendly people, fantastic weather and superb restaurants. I’m really pleased you enjoyed your stay and thank you for your kind feedback. We work hard to keep the standards high and comments like yours make it all worth while. The location speaks for itself, we never get tired of the view, it’s something special and we are very lucky. Photos just don’t do it justice. We would love to see you back again sometime. Me and my husband had a lovely stay at Carpici and in Kas. We loved the house and it provided with everything. There is even a water cooler. Ian, Omer and co have been amazing and a large part of our good experience in Carpici. Kas is a small city in Turkey, still we were able to do something new everyday. On our 12-day stay at carpici, we stayed in home for 3 days, simply because we wanted to enjoy the amazing view a bit more and relax by the pool. My husband hated the hill so we got a taxi every night after dinner etc. I however, like a bit traning and think the hill is a very good way of ending the day. Thank you for your kind feedback. I am really pleased you had a special time and we would love to see you back sometime. The hill is quite steep, but as you have said taxis are very easy to find down in town if you are not inclined to walk back up. Kas is built on a mountain side, which gives it its character. Our location is all about the views and combined with our commitment to provide high quality accommodation, we hope that everyone who stays with us has a special holiday experience. Amazing accommodation and perfect for family with teenagers. We were 2 adults with our 2 children, 19 and 16, and their 2 friends, so having 3 bathrooms and so much space was perfect. We loved the fact that we were so close to the town, giving us all independence, and as it is so safe, we were more than happy for the kids to return home at 3am, allowing us less energetic adults to come back before them. There was nothing missing from the well stocked kitchen, and we appreciated the agents bringing water to us whenever we needed it, as well as the grocery pack waiting when we arrived. As the apartment is so central, we could just decide daily what we fancied- lunch in town, then picking up meat etc from local shops, to have a BBQ at home, or to come back for a swim in the pool, aperitifs on the balcony, then back to town for dinner. So many great restaurants- we were spolit for choice. We did a boat trip which was amazing- swimming with baby turtles, then BBQ fish and salad for lunch- highly recommended- and we were glad we had chosen one with fewer passengers- it was like a private trip ! We loved the Friday market- and had an extremely cheap and yummy lunch of savoury pancakes and freshly squeezed juice- under the olive trees, people watching. Overall a great holiday with wonderful accommodation. Great to hear you really appreciated the size, the location and the attention to detail of our apartment. Kas is a special place for a holiday and it's great for all age groups. We hope to see you back in Kas one day. Well presented, beautiful location and lovely layout. I wouldn't have changed the location for anything. Absolutely perfectly placed apartment - great for sunsets and SO glad for the pool! We had a great time, stayed around the pool a bit, did a few dives around Kas with Dragoman scuba diving company, enjoyed the cute turko/greek cafes and restaurants (all really friendly people in the town!) and actually really appreciated the hilly steps up to the accommodation - great exercise for the family at the end of the day! Also had a wonderful time exploring Kastellorizo, such a beautiful island with friendly locals and cute houses. Overall, very memorable 5 days in Kas. We're really pleased you appreciated the apartment and location. Hopefully we will see you back in Kas sometime in the future, 5 days is just not enough. Fantastic apartment everything was exactly as described. Very clean and very well equipped. One thing we particularly liked is that you had access directly to the pool from the main bedroom and also had a great balcony with fantastic views and dining facilities on the first floor. We usually eat out every night but the views were so fantastic we did not want to leave them and actually ate in half the time. Also found there was everything available to make this a pleasant and enjoyable experience. Omar and Hilary who looked after the property were always on hand if you had any questions or wanted advice or recommendations. Would definitely return to his beautiful apartment and would recommend to anyone. Thank you for your review, it is very difficult when choosing accommodation from a web site, to quantify the quality of the accommodation. Your phrase "was exactly as described" is what we aim for. We want those who stay with us to enjoy the apartment as we do and appreciate the attention to detail. Unlike the World of Hotels the reviews for Self Catering Apartments can be few and far between so it makes choosing (based upon recommendation) that so much more difficult, that is why I just had to review this amazing apartment. Carpici is a Luxury Duplex Apartment with unrivalled Panoramic views from as far as 'Meis' to the end of the 'Pennisular' and the 'Marina', and of course the old 'Harbour in the middle, all of which could all be enjoyed from the many vantage points offered, such as the Bedroom Terrace, the amazing Balcony off the entertaining area, or just resting on the edge of the Infinity Pool. But unlike so many which really upon a view Carpici has an Ace up its sleeve in the form of a Modern, Stylish Apartment, I have paid considerably more for a Bedroom and En-suite Bathroom at highly rated Hotels, but they have fallen far short of Carpici. The apartment has 3 double bedrooms all with their own Hotel Style Bathrooms, and of course the Master Bedroom has everything you'd expect, en-suit, Sea-Views and its own Terrace. There is also a Modern well equipped Kitchen which was so good we even ate in on a couple of evenings which is totally not like us, but we just wanted to enjoy a meal in the amazing Balcony overlooking KAS, a view I think you'd find hard to beat at any of the Restaurants in the town below. One last thing which perhaps I should have mentioned earlier, is the professionalism shown not only by Ian (the owner) with his caring and efficient approach, but Hilary and Omer who live in Kas and manage the apartment in Ian's absence, but don't underestimate what these guys do, not only do they keep the Apartments , Pool and the Gardens looking amazing, but they offer what I would call a 'Concierge Service' in so much as Hilary and Omer helped with Transfers, Taxis, arranging special Birthday Cakes and Restaurant Bookings, truly amazing people and the Icing on what was already a really good Cake! Ps. Like they say in the advert, don't tell everyone, because while Carpici becomes more and more successful, I still want to be able to visit myself! Thank you for your kind words. We are lucky to have found Kas and to have had the opportunity to buy into somewhere special. We have drawn on our experiences of holiday accommodation over the years and have tried to make sure our apartment is to a standard that we can enjoy and feel comfortable in and hopefully our guests appreciate the attention to detail. Omer and Hillary are a great team and we are lucky to have them. Diving, Paragliding Sailing & Mountain Biking are the key sports based activities in Kas. Kas is one of the Mediterranean's best diving locations, with crystal clear waters and a wide range of reefs to explore, both natural and man made. Local dive schools can be recommended. All boats are based in the harbor below the apartment. Paragliding takes place from a purpose built launch site 20 minutes drive above Kas. Both individual tuition & tandem paragliding flights can be booked for those who want a "lifetime experience" to go home with. The cost is around €90 for a tandem flight that lasts around 40 minutes & lands on the harbour side below. Clear skies & gentle mountain breezes provide near perfect conditions for most of the time from April until November. Early season & later season holidays provide comfortable temperatures for exploring the wonderful local archeological sites or walking the Lycian way. The new marina is home to 400+ boats, local Gullet hire can be arranged. Little Pebble Beach, 10 minutes walk down the hill and the many bathing platforms that surround it, provide an excellent location for a quick dip or a long lazy day in the sun. Beds are provided free if you buy a drink or a snack. Outside of Kas you have Big Pebble Beach 2km east. Limonagzi is a beautiful cove to the east with a small restaurant, hammocks and sunbeds, accessible via a 20 min water taxi ride. Kaputas is a beautiful sandy beach 20 minutes by car on the D400 west towards Kalkan. Dalaman Airport is 2 hours away by car. Antalya is 3 hours by car. Check both airports to get the best prices and flight times. Dalaman is preferable and is a straight forward drive along the D400 coast road. The coast roads in Turkey from both airports have been recently upgraded and are good roads, however transfers by Taxi can be arranged through our Agent in Kas. Please ask at the time of booking for a quote. Kaputas beach 20km 20 minutes by car. Kalkan 25km 25 minutes by car. Patara beach 40km 45 minutes by car. Fethiye Town 90km 1 hour 10 minutes by car. Kekova sunkun city 35km 45 minutes by car. All these locations are accessible by Dolmus (mini bus) and regular services run through out the day from Kas bus station. About Kas: Kas is a small friendly cosmopolitan holiday town that has grown up over the last 40 years from a quaint fishing village only accessible from the sea ,to a sophisticated seaside town which has retained its Turkish identity. Located under the lower peaks of Mount Akdag (9,802ft), Kas is the jewel of the Turkish Riviera, a relaxed place, with lots of charm and character. It provides an excellent base from which to discover the magnificent scenery and unique archaeological sites of the Lycian coast whether it’s the local Lycian tombs around Kas, the newly restored Roman Amphitheatre on the edge of town, or the Sunken city at Kekova, where you can look down on the ruins of a once great city beneath the sea. There is something for everyone. Kas is however still a working town, with all the shops, boutiques, bussling markets and restaurants that cater for tourists and locals alike. The beaches in and around Kas tend to be pebbly rather than sandy and this combined with its historic lack of accessibility and the availability of flat land accessible to the sea, has meant that the mass tourism market has not taken hold, their are only a couple of medium sized hotels in Kas. A plush new marina and club has just opened on the edge of Kas, catering for everything from small day boats to Super Yachts. An English speaking doctor and an english speaking pharmacy is available anlong with, banks with cash point machines and a range of supermarkets. A large market (behind the bus station every Friday) is very much the highlight of the shopping week. Great for designer label sweat shirts and t shirts, football kits, leather goods, spices, fruit and vegetables. Booking Notes: Deposit of 25% of total cost required within 72 hrs from confirmation of booking. Final balance required 60 days before departure. Bookings under 60 days from departure, must pay the full balance to secure the booking. A breakage deposit of £200 is payable with the booking and will be refunded within 14 days of the end of the holiday. End of stay cleaning is £45, Laundry and towels are charged at a flat rate of £25.00 per stay. 14 day bookings include complimentary cleaning & fresh bedding & towels on day 7. Changeover Day: Change over days are flexible. except in July and August, when bookings are from weekend to weekend. The apartment will be available from 3pm on the day of arrival. Guests are required to be ready to leave the apartment by 11 am on final day. Notes on prices: End of stay cleaning £45.00. Bedding & towels are charged at a flat rate of £25.00. In July and August, minimum stay is 7 or 14 nights. Complimentary cleaning & fresh bedding & towels are provided on day 7 for 14 day bookings. 10% 2 Person discount, (not July/Aug). Late booking discount of 10% off, if booking under 14 days before arrival. Please ask for availability & rates.